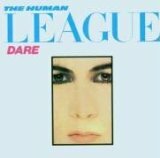 New Wave synth-pop band Human League had a rough go from formation in 1977 until the hugely successful third album Dare!, which came out on October 20, 1981 and featured the hit “Don’t You Want Me” (one of the highest selling British singles of all time). HL started out as an all-male quartet playing art-synth-rock, although only two of the members (Martyn Ware and Ian Craig Marsh) had any real depth in music. After two disappointing albums and with mounting debts and pressure from their record label, HL splintered and Ware and Marsh quit to form Heaven 17. That left Philip Oakley (lead vocals) and Adrian Wright (not much more than an equipment manager) to hire accomplished musicians to support them while Wright began to learn the synthesizer. Oakley ended up recruiting two teenagers, Joanne Catherall and Susanne Sulley, as backup vocalists, but they quickly moved to the front next to Oakley. Dare! was released on the heels of and includes three U.K. singles from mid-1981, “The Sound Of The Crowd” (#36), “Love Action (I Believe In Love” (#3) and “Open Your Heart” (#6). But it was the unexpected, runaway success of the chart-topping single lifted off the album, “Don’t You Want Me” that drove Dare! to #1 on the British album charts and #3 in the U.S.
Dare! is available as download tracks from iTunes (click here) and as a CD from Amazon (click here).